Recalled Baby-product Attorney Jeffrey Killino understands the impact a product recall, especially one involving baby products, can have on families. Every year, thousands of dangerous or potentially dangerous products are recalled, a great many of which are intended for use by infants or children. The reasons for recall vary, and range from lead-paint poisoning hazards to faultily designed or assembled cribs and toys. If a defective or recalled baby product, such as a crib, toy, or other baby product, has caused injury to your infant, toddler or young child, contact defective baby-product and recall lawyer Jeffrey Killino at 877-875-2927 to discuss your legal options. In 2007, Mattel, Inc. recalled 436,000 toys that had been coated with lead paint (the “Sarge” die-cast vehicles from its “CARS” toy line) and offered replacement products to consumers. As a dedicated child-safety advocate and toy-recall attorney, Jeffrey Killino filed a lawsuit against the corporation that resulted in an order forcing the company to set up a fund that concerned parents could access to have their children tested for lead poisoning. The Consumer Product Safety Commission (CPSC) issued the largest U.S. crib recall that same year, involving more than one million Simplicity and Graco cribs, a defect of which was responsible for at least three infants’ deaths. Only two years later, on December 15, 2009, the CPSC issued one of the biggest product recalls in history, involving over 50 million Roman shades and blinds that were reported to pose strangulation, chocking, and suffocation hazards. More than 80 percent of all U.S. toys are now made in China and few of them get inspected. Every year, more than 202,000 children in the United States are treated in hospital emergency rooms for injuries associated with toys. Yet, despite these statistics, progress is being made to keep our children safe. The Consumer Product Safety Improvement Act now restricts how much lead and phthalates may be contained in children’s toys. Toys are only one of a large number of products that may pose hazards to infants and children, and lead paint is only one of the countless defects discovered in toys. Lead-paint exposure, due to toys that have been coated with the material, has the potential to cause serious and even deadly injury. Victims may experience a number of physical and psychological effects, including learning disabilities and seizures. Children who are overexposed to lead are particularly susceptible to injury and often experience severe physical and mental disability as a result of their exposure. In addition to lead-paint used in the manufacture of toys, small parts may also pose a hazard, including the potential for choking. Magnets and small batteries may be swallowed by young children and cause serious injury or death. Child-safety experts recommend that magnets be completely covered and encased within a heavy-duty material that cannot be chewed or broken apart by a young child. The CPSC warns parents to be vigilant for dangerous elements in toys, and the American Academy of Pediatrics (AAP) urges parents to keep abreast of the latest product-recalls by consulting, the CPSC’s website, for example, which lists products recalled for a wide variety of reasons, including fire, choking, and strangulation hazards. Although the government mandates strict standards from toy manufacturers, potentially dangerous recalled toys keep finding their way into the hands of unsuspecting parents and children. The most commonly overlooked dangers posed by toys are sharp edges, flammable materials, small pieces that pose a choking hazard, battery-operated toys, toys with “hair or fur” that can be ingested and aspirated, toys with strings longer than 6 inches that can pose a strangulation hazard, and toys containing lead or chemical contaminants. 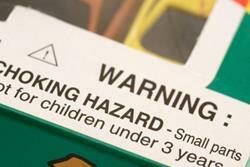 Numerous non-toy products also pose dangers to infants or children. Examples include crib mobiles, infant seats for shopping carts, baby walkers, pacifiers, high chairs, car seats, strollers, certain types of clothing, stuffed animals, dolls, and cribs. Manufacturers of these products are required to follow standards set by both the CPSC and the Child Safety Protection Act. Defects in manufacture or design, or inadequate warnings, however, continue to cause thousands of devastating injuries per year. Legal liability for injuries caused to children through use of defective baby or child products is governed by the law of dangerous and defective products, also known as the law of product liability. Such actions may be brought under negligence, strict liability, or breach of warranty theories. Product-liability actions are warranted when a product is unsafe for its normal or intended use or contains a defect in manufacture, design, or assembly. Such actions may also be brought when a product is improperly marketed or contains inadequate warnings or instructions regarding its use. In order for you to be successful on a product-liability claim brought to recover damages for injuries your child has suffered as a result of using a defective baby or child product, your attorney will need to establish certain elements required for all such actions. Each of these elements must be established by a preponderance of the evidence. This means that you must prove that it is more likely than not that each element exists. First, you will need to prove that the product in question is defective in some way. This proof can be quite complex and require the testimony of several experts, depending on the nature of the defect and the number of defects involved. You must also establish that your child has suffered an injury in order to prevail in a product-liability action. The existence of a defect is not enough, in other words. If a product contains a defect, but the plaintiff did not suffer an injury, no action may be maintained. Expert testimony may be needed to establish this element, as well. Though many plaintiffs have trouble distinguishing between the requirement of Injury and the requirement of Causation, these are separate elements requiring separate proof. Expert testimony may also be employed to demonstrate the particular defect in a product was a cause of the plaintiff’s injuries. That a defect exists and a plaintiff was injured is not enough; the plaintiff must establish that the injuries resulted from the defect. The element of Damages is distinguishable from the element of Injury. Only certain injuries are compensable under the law, in other words, and those are the injuries for which you may obtain legal damages. Each element in a product-liability case has its own complexities and requires the assistance of experts, including an attorney experienced in such cases. When your product-liability action relates to a particular type of product, such as one intended for use by infants or children, obtaining the assistance of an attorney experienced in lawsuits involving that particular type of product may be crucial to your success. Attorney Jeffrey Killino has been at the forefront of keeping children safe from potentially dangerous products and has extensive experience with law suits involving injuries caused by defective and recalled products designed for use by infants or children. If your child was injured as a result of a recalled toy, a faulty crib, or other defective baby product, you may be entitled to compensation from those responsible. Contact Recalled Baby-product Attorney Jeffrey Killino at 877-875-2927 for expert and compassionate assistance in obtaining the justice to which you are entitled.